SKU: 9350764001258. Categories: Home Safety Category, Bed Guards. Tags: Babyhood, Nursery Accessories. At babyhood we understand that your little toddlers need to feel safe and secure at bedtime. The transition from their cot to a bed can sometimes be challenging for them and you. 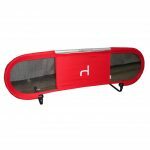 The babyhood Deluxe Fold Down Bed Guard is longer than most bedguards at 126 cm in length which helps to keep your precious little ones in the bed and off the floor. In addition it provides excellent versatility for many beds including slat beds and ensembles. It is easy to assemble, ultra light weight and comes with a take a long carry bag for convenient travelling. Most importantly it includes a safety strap to attach the bed guard to your child’s mattress for added safety. Reccomended to be used with slat beds or ensembles. Recommended to be used with slat beds or ensembles.